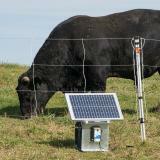 A reliable and visible electric net for cattle. A prefabricated fence that has 4 horizontal conductive twines; is 48" tall installed, and has large white plastic vertical struts every 24" White PVC posts are built into the mesh every 12.5'. The black and white colors provide 24/7 visibility to both humans and animals against light and dark backgrounds. 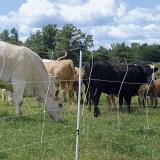 A temporary or semi-permanent cattle fence. 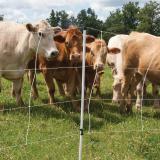 Great for calves that like to escape from a 2 strand fence. 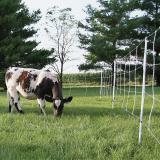 Can be used at gateways and to protect windbreaks and feed supplies. Vertical Strands Plastic struts, spaced every 24"
Simple and quick to install and remove. Visible to deer so that they go around instead of through the net. 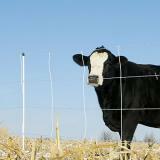 Adjusts to terrains and curves better than other fences. #208002 - $1.10 per ft (100' roll with double spike posts). 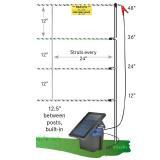 #208001 - $1.34 per ft (50' roll with double spike posts). 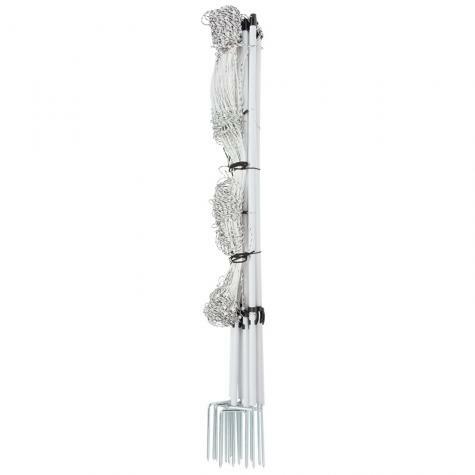 Number of reviews: 6 customers reviewed this product. Recommended: 6 out of 6 said they would recommend this product to a friend. We like that this goes up much faster and easier than a reel fence. 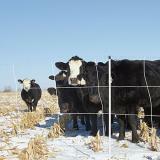 Makes a quick laneway or corral that your cattle will respect. Quick service and good quality fencing. It was quick and easy to put up sturdier than expected.